Sigmund Yacht Design has used innovative building materials to reduce weight and increase space onboard its new 60m sailing yacht Vestar. The model’s carbon reinforced plastic, constructed using titanium graphite laminate, has a higher strength/weight ratio than traditional materials. This means thinner layers can be used, increasing space and reducing the boat’s weight. Despite its cutting-edge credentials, Vestar’s lines are classic and elegant, and its proportions balanced, giving it a broad appeal. Inside, the hull has been designed to provide an open and ergonomically sound interior. The widest part has been brought aft and provides the greatest space through beam for the most important living areas; the owner's saloon, viewing lounge and pilot house. 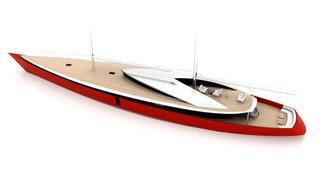 Vestar will have a maximum beam of 12m and a keel-up draught of 4.2m. Displacement is calculated at 650 tonnes with total sail area of 2,413 square metres.